Why aren’t migrants queuing to come here? A swimmer is killed from a shark attack at an Auckland beach. Air New Zealand launches another of its quirky safety videos showing British adventurer Bear Grylls battling some rough New Zealand terrain. And a large school of orcas is spotted in Wellington harbour. These may not all have been good news stories (quite the opposite actually with the gruesome shark attack) but they gave New Zealand exceptional global news coverage last week. All of these stories appeared in major European newspapers. Some even featured on television. For New Zealand to make the international headlines at all, let alone three times in a week, it takes events like these. While we in New Zealand may get overly excited about things like the Novopay debacle, the Dotcom extradition saga or the debate around asset sales, the world outside only notices New Zealand for its human interest stories, animals or natural disasters. Seen from abroad, New Zealand appears to be some exotic and slightly unreal destination about which not much else is known apart from its natural beauty (and its natural dangers). In a way, all the taxpayers’ millions spent subsidising the production of The Hobbit were probably unnecessary because the world has always believed us to be some kind of Middle-earth anyway. They hardly needed convincing that New Zealand boasts some of the world’s most spectacular landscapes. What international observers are less aware of is that New Zealand actually has more to offer than fantastic scenery, flora and fauna. A good education system, a high quality of life and some innovative companies, for a start. But to be blunt, some Europeans and Americans would probably be surprised to learn that New Zealand has running water and electricity. I am exaggerating here but it is a fact that very little is known abroad about New Zealand as a country to live and work in. Instead, it is seen as a destination for the holiday of a lifetime – even though relatively few actually make it to these shores as tourists. For example, an opinion poll revealed that New Zealand was the Germans’ third most dreamed of destination (after the US and, well, Australia). Yet only 43,000 Germans holidayed here last year. New Zealand’s international reputation as an exotic holiday destination is certainly a plus for the tourism industry. According to the government, the sector is New Zealand’s second largest export earner, contributing 15.4% of total export earnings ($62.2 billion). It also employs 119,800 fulltime equivalents or 6.2% of total employment. So far, so good – although the stagnation in the development of the tourism sector is worrying. But what does New Zealand’s image mean for the rest of our economy? Could it be that New Zealand’s clean, green, exotic Middle- earth-like perception is dominating all other aspects of life? Last week, Statistics New Zealand published its latest International Travel and Migration statistics. For the year to January, our net migration gain was a full 12 people. While 85,647 had departed permanently, another 85,659 moved to New Zealand leaving an extra dozen of residents. These results are remarkable for two reasons. First, New Zealand is trying to attract qualified candidates to address reported skills shortages in many sectors. And second, there are lots of well-qualified, young, and unemployed people around the world, particularly in those countries affected by the euro crisis. 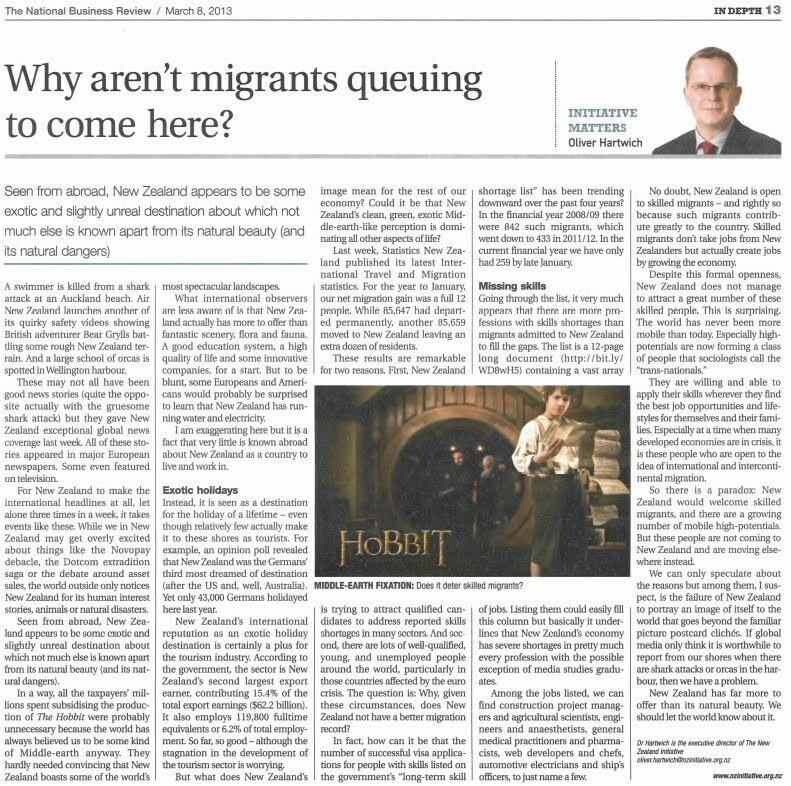 The question is: Why, given these circumstances, does New Zealand not have a better migration record? In fact, how can it be that the number of successful visa applications for people with skills listed on the government’s “long-term skill shortage list” has been trending downward over the past four years? In the financial year 2008/09 there were 842 such migrants, which went down to 433 in 2011/12. In the current financial year we have only had 259 by late January. Going through the list, it very much appears that there are more professions with skills shortages than migrants admitted to New Zealand to fill the gaps. The list is a 12-page long document (http://bit.ly/WD8wH5) containing a vast array of jobs. Listing them could easily fill this column but basically it underlines that New Zealand’s economy has severe shortages in pretty much every profession with the possible exception of media studies graduates. Among the jobs listed, we can find construction project managers and agricultural scientists, engineers and anaesthetists, general medical practitioners and pharmacists, web developers and chefs, automotive electricians and ship’s officers, to just name a few. No doubt, New Zealand is open to skilled migrants – and rightly so because such migrants contribute greatly to the country. Skilled migrants don’t take jobs from New Zealanders but actually create jobs by growing the economy. They are willing and able to apply their skills wherever they find the best job opportunities and lifestyles for themselves and their families. Especially at a time when many developed economies are in crisis, it is these people who are open to the idea of international and intercontinental migration. So there is a paradox: New Zealand would welcome skilled migrants, and there are a growing number of mobile high-potentials. But these people are not coming to New Zealand and are moving elsewhere instead. We can only speculate about the reasons but among them, I suspect, is the failure of New Zealand to portray an image of itself to the world that goes beyond the familiar picture postcard clichés. If global media only think it is worthwhile to report from our shores when there are shark attacks or orcas in the harbour, then we have a problem. New Zealand has far more to offer than its natural beauty. We should let the world know about it.